When you first get your Oculus Rift set up in your house, the desktop app installed and everything ready to go, you might think the only place to get games for it is directly from Oculus’s desktop app. While that’s certainly one place to get them, you actually have a lot of options for places to get Oculus Rift-supported games, even in some places you wouldn’t expect. In all fairness to the Oculus Rift desktop app, it is certainly the best place to get Oculus Rift games that will have the least chance of issue running on the Rift. The Rift Experiences, as Oculus calls them, are all listed there with VR support specifically for the Rift. There’s no tinkering around in tons of settings necessary to get them working on the headset. And, there are plenty of incredible games that you’ll only be able to find here, like Robo Recall. 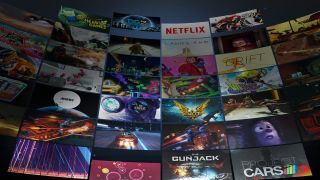 If you don’t have the Oculus Rift desktop app, you can also go to the Oculus site’s Rift Experiences section to discover games and other content that will run on an Oculus Rift. Just like the games you’d find in the Oculus Rift desktop app, these titles are made to run on the Rift without any weird compatibility modes. As long as you have a computer powerful enough to support your Rift and meet the game’s system requirements, you should be good. The games you find on the Oculus site will be the same as you’d find in the Oculus Rift desktop app. You still have other options, though. By far, the most popular digital game store is Steam, and it has no shortage of VR games and content. Using Steam VR, plenty of games will work with the Oculus Rift, though some work better than others. If you want to find Steam games that should run well on the Oculus Rift, you can check out this Steam Store page which has a filter for games that specifically support the Oculus Rift. The Steam Store is a great place to find Oculus Rift games, because you’ll be able to come across plenty of early access titles and small indie ones that may run on the Oculus Rift but won’t be on the Oculus App. Steam’s review system can also be helpful for determining whether a game is worthwhile. And, since Steam offers a decent return policy, you can even try out games to see whether your computer can handle them or whether they work well on the Rift without worrying about wasting money on a game you can’t play. If you’re hoping to score a good deal on VR games for the Oculus Rift, you can actually find a decent selection on Humble Bundle. You’ll be able to see which VR platforms are supported by each game, making it easy to make sure the game you’re eyeing will work on the Rift. Many of the titles you’ll find on the Humble Bundle site will be the same you’d see on Steam, but they may have discounts unique to Humble Bundle. If you’re a frugal VR gamer, keep an eye here. Perhaps one of the most surprising places to find games for the Oculus Rift is from its largest competitor. HTC’s Viveport isn’t just for the HTC Vive headset. You can actually find games that will run on the Oculus Rift there as well. HTC has instructions on using Viveport with the Oculus Rift desktop app, and the Viveport store page clearly shows the Oculus logo on games that support the Oculus Rift headset. You can even filter for titles that specifically support the Rift. And, the Viveport Subscription offers Rift-supported games, in case you want a batch of new games delivered to you each month. If you’re looking to find the best of the best without having to sift through user reviews, though, we’d highly recommend our picks for best Oculus Rift games.